General Secretary of the Communist Party of Vietnam (CPV) Central Committee Nguyen Phu Trong and Prime Minister of Hungary Viktor Orban agreed to lift bilateral ties to the level of comprehensive partnership during their talks in Budapest on September 10. 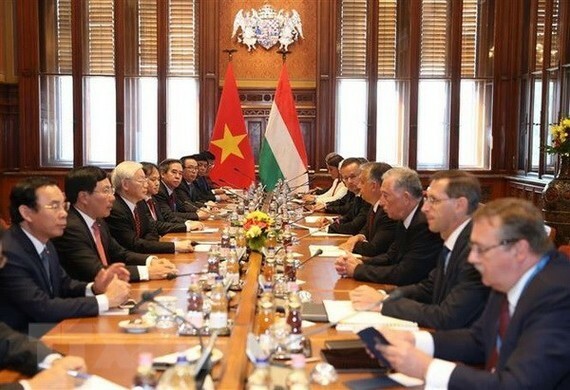 The CPV chief said Vietnam considers Hungary a leading partner in central Eastern Europe and congratulated Hungary on scoring a number of important socio-economic achievements, catapulting the country into the position of one of the leading economies in the European Union with political stability and social unity. Orban, for his part, said Hungary considers Vietnam its most important partner in Southeast Asia, affirming that the visit will create a new milestone and driving force for the bilateral traditional friendship and multifaceted cooperation. Both sides agreed to maintain regular visits and exchanges between high-ranking leaders, strengthen political consultations and strategic dialogues via Party, Government, and National Assembly channels, as well as between ministries, agencies, and localities. They expressed their determination to foster effective collaboration in diverse areas, especially in economy, trade, investment, national defence, education-training, science-technology, environment, healthcare, culture, sports, and tourism, as well as share experiences in maintaining and upholding traditional cultural identities during the process of development. Host and guest pledged to strengthen consultation on regional and global issues of shared concern and effective cooperation at multilateral organisations and forums, particularly at the United Nations, the Asia-Europe Meeting and the Mekong-Danube Cooperation Initiative. The General Secretary affirmed that Vietnam supports Hungary in extending coordination with ASEAN member states and stands ready to serve as a bridge for the country to expand economic ties with the bloc. Expressing commitment to promoting the Vietnam-EU comprehensive partnership, the Hungarian PM vowed to push forward the early signing, ratification, and full implementation of the EU-Vietnam Free Trade Agreement, contributing to reinforcing EU market connectivity, including that between Hungary, Vietnam, and the ASEAN. 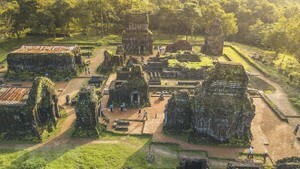 As there remains room for bilateral partnership, the two sides asserted to increase activities of the Vietnam-Hungary Inter-Committee on Economic Cooperation; create favourable conditions for the two countries’ business communities to meet and seek new opportunities; as well as expand cooperation in healthcare, water management, information technology, pharmaceuticals, food safety, environment protection, and renewable energy. The Vietnamese leader hailed Hungary for considering Vietnam a priority partner in its official development assistance policy. He suggested working closely together in fields that suit Hungary’s capacity and meet Vietnam’s demand. He thanked the Hungarian government for committing to continuing the supply of the 200 scholarships it awards to Vietnamese students each year. The two sides welcomed the signing of several cooperation documents in national defence-security, justice, healthcare, education-training, and the organisation of the second Hungary-Vietnam conference of universities rectors in Budapest. They promised to expand ties across culture, sports, and tourism in order to raise mutual understanding and friendship between the two peoples, as well as to step up the plans marking the 70th anniversary of diplomatic ties in 2020. The host said the Hungarian government will continue to provide all possible support for Vietnamese nationals in Hungary so they may lead stable lives and serve as a bridge connecting the two nations. Following the talks, the two leaders held a press conference, issued a joint statement on the establishment of the Vietnam-Hungary comprehensive partnership, and witnessed the signing of several important cooperation documents.